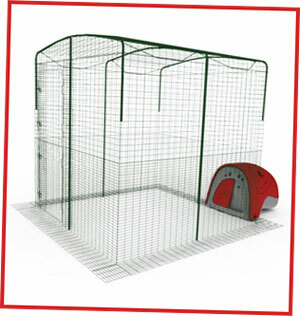 Been thinking about buying an Omlet Walk in Run for your hens? Well, now is the time to do it! Buying a WIR now will ensure that your chickens have plenty of room to run around in during the winter months, when you might not want to stay out in the garden with them while they free-range. A WIR will make a wonderful christmas present for your pets when you can’t think of anything else to buy them. And, the best reason of all..buy a Walk in Run this week and get not one, not two, but three freebies! That’s right, buy any Walk in Run and we will give you three of our best-selling covers free! These are worth a total of £48! Please note this offer does not apply to the Walk in Run Extension. Buy any Walk in Run and get three covers for free!